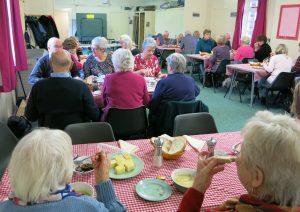 Winter Warmer Soup Lunch 22nd February 2019. 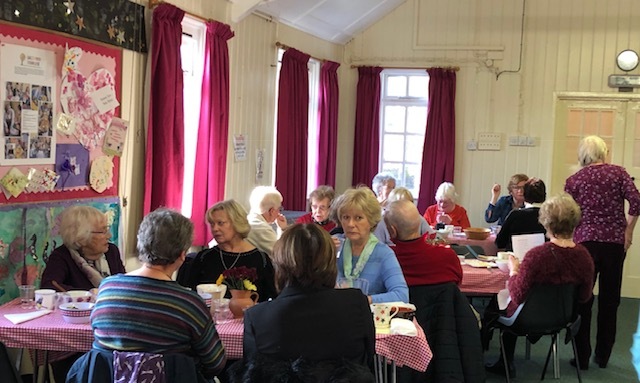 On Friday 22nd February the weather was a bit odd, changing from fog to sun and back to fog again, but all was bright in the Lads’ Club where 33 members and guests gathered for a soup lunch. 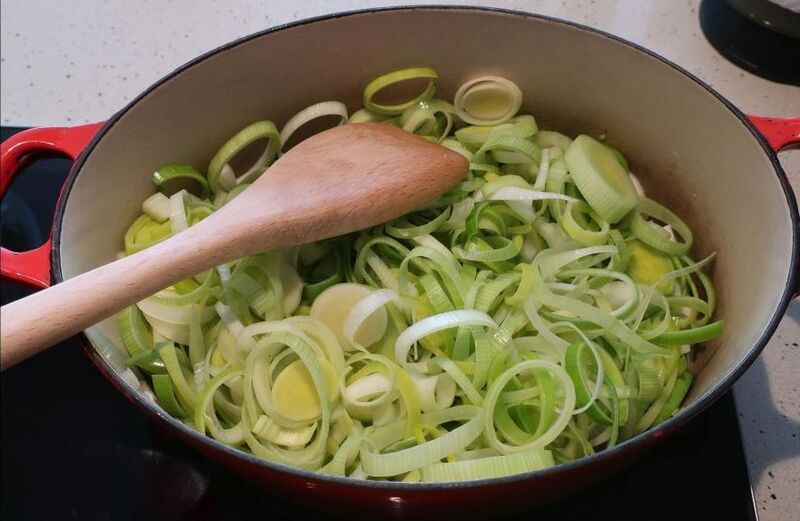 Leek and potato soup being prepared. The soup was the ever-popular leek and potato with plenty of bread, cheese and chutney to go with it. Brian Doorne gave a vote of thanks to the committee who had organised the event. 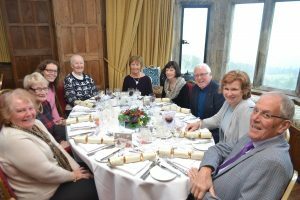 Christmas Lunch at Lympne Castle 4th December 2018. 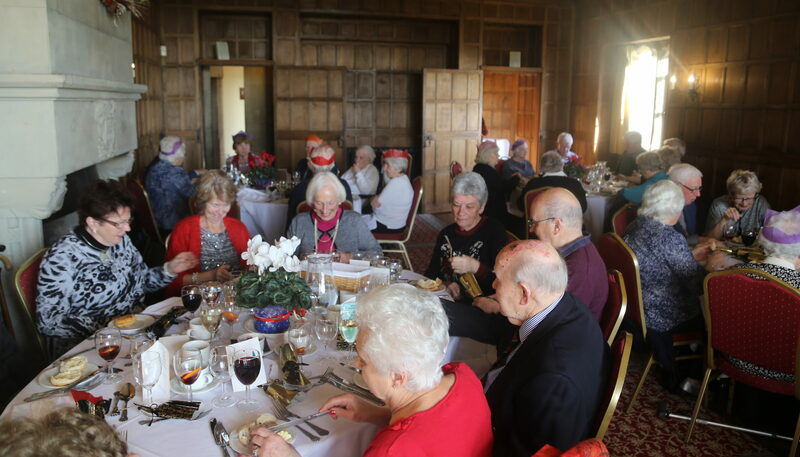 Almost fifty members with partners and friends attended this splendid lunch on a lovely sunny winter’s day. Once again the venue was the perfect blend of history, warmth and beautiful Christmas decorations. The staff were welcoming, helpful and efficient which made the event very relaxing and enjoyable for both organiser and guests. We were welcomed with a glass of mulled wine or fruit juice. 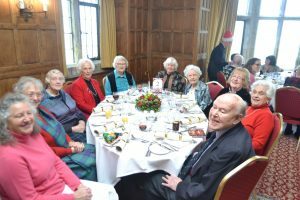 After pulling our crackers and exchanging the jokes we all enjoyed an excellence 3 course meal followed by warm mince pies and coffee or tea. There was the usual WI raffle with special Christmas prices that included Belgian chocolate biscuits, Prosecco and the lovely cyclamen that had decorated the tables. 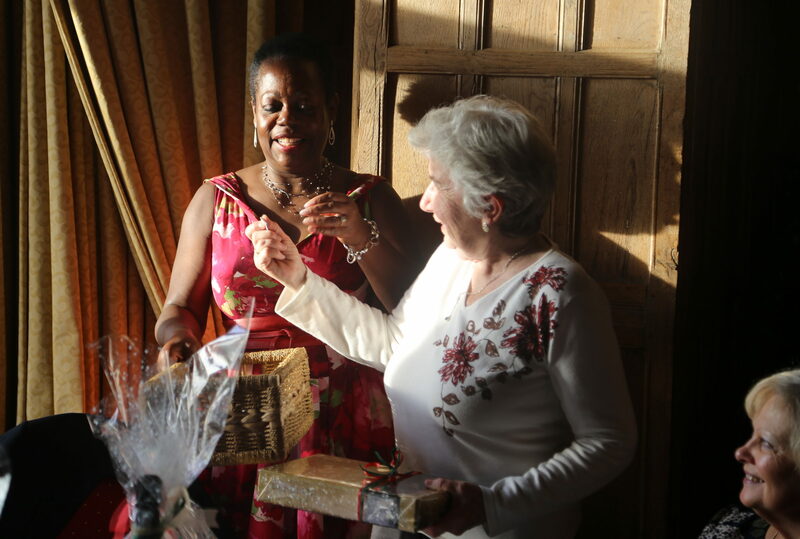 Many thanks go to Hortense for all her hard work arranging this event ! Also to her husband Gerald for taking the pictures you can see in the gallery below. 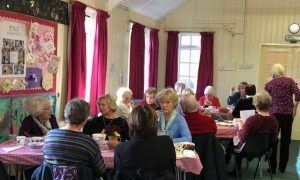 Winter Warmer Soup Lunch 23rd November 2018. 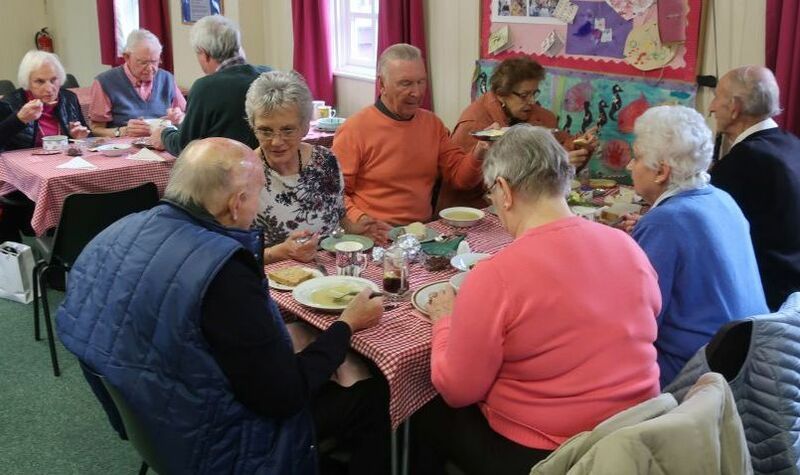 Members, husbands and friends gathered in the Lads’ Club on November 23rd to enjoy another of our Winter Warmer Soup Lunches. This time the soup was Leek and Potato and was accompanied by bread, butter, cheese and chutney. A contented hum was heard as we settled down to chat with friends old and new and to enjoy the delicious soup. 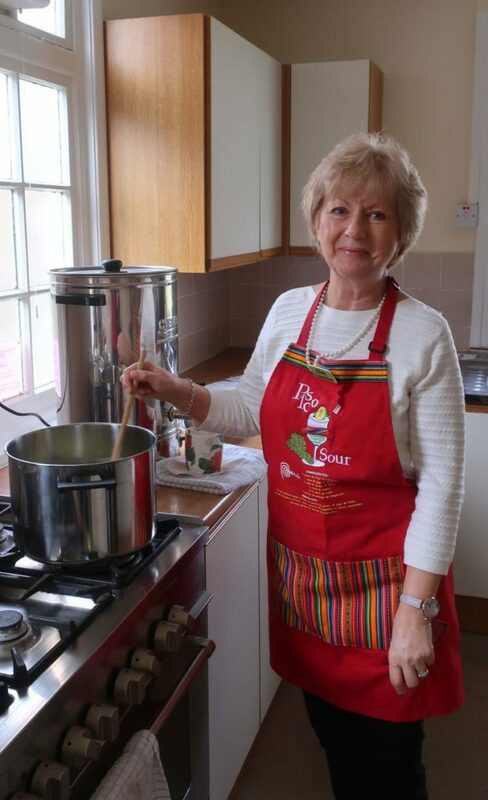 Kay Hygate thanked the committee for organising the lunch and for making and serving the soup. Thanks, must also go to Kay and Chris Hygate and Michael Daisey for putting out the tables and chairs. EKFWI Top Team Quiz on Thursday 25th October. On Thursday 25th October Kate Dilks, Daphne Gazely, Barbara Thorburn, Marjorie Mitchell and Margaret Alcock took part in the annual EKFWI Top team Quiz. It was for teams of 6 but we could only muster 5 however, we did our best. The questions were interesting and varied and when the answers were given out we sometimes kicked ourselves, groaned and wondered how we could have been so stupid. Nevertheless, we scored 67 points out of a possible 80 and (according to your correspondent who was on the team) we came joint 9th out of 24. The winners scored 74 points. The most fiendish round was when we were given cryptic clues for the most obscure London Tube stations. It was a very pleasant afternoon (with refreshments) and we will be putting in a team next year with, hopefully, a full complement of 6. Visit to Chatham Dockyard on Thursday 4th October. Nine members accompanied by fourteen husbands and friends, travelled to Chatham Historic Dockyard on a misty morning. The journey was good and our first port of call on arrival was the restaurant where coffee/tea and biscuits awaited us. Refreshed, we boarded the coach again for a forty-five-minute tour of the dockyard during which our knowledgeable guide pointed out the many interesting buildings and ships and regaled us with stories about them. After lunch most of the group joined what was the highlight of the visit, the Call the Midwife tour. We were greeted at the meeting point by a “midwife” who took us on a very interesting tour, pointing out the various locations where the show is filmed and showing us photographs of scenes at each location. We saw the exhibition of props from the series (including an iconic bicycle) and saw some very realistic exterior props, very solid looking doors which were in fact made of plywood. We all agreed that this had been a very good day out. 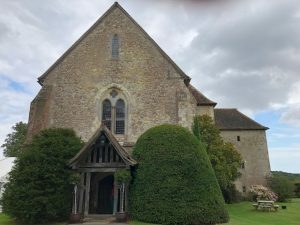 Visit to Bilsington Priory on Tuesday 14th August. Bilsington Priory is a former Augustinian priory in the village of Bilsington, Kent. It was founded in 1253 and suppressed in the Dissolution of the Monasteries in 1536. Some of its buildings survived and were converted into a farmhouse. In 1906 they were restored to designs by JT Micklethwaite. They are Grade I listed. 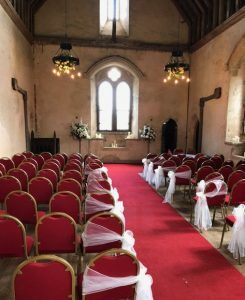 The priory is now a wedding and conference venue. 16 of us arrived at the car park at 2pm to be greeted by Zena and led up to the priory. Zena gave a very interesting and informative talk on the history of the priory. She explained that she has worked at the priory for 20 years and has become an avid amateur historian. After speaking for 35 minutes she showed us round the building and explained the various features. 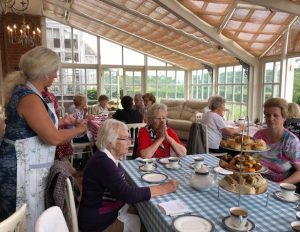 At around 4pm we were shown to the conservatory where tables were laid for afternoon tea. 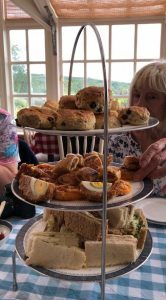 There were pots of tea, or coffee if you preferred, with brown and white dainty sandwiches, sausage rolls, scotch eggs and cheese pinwheels. There were plain or fruit scones with jam and cream. 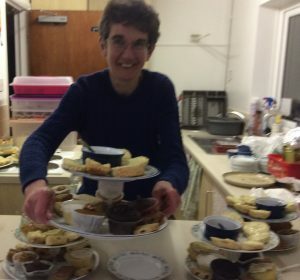 Also, a large selection of cakes including mini Bakewells, lemon drizzle cake, mini Victoria sponges, macaroons and mini coffee and walnut cakes. We all had our fill and we were even given doggy bags to take home. The only blot on the afternoon was a couple of pesky wasps who wanted our jam! A lovely time was had by all. 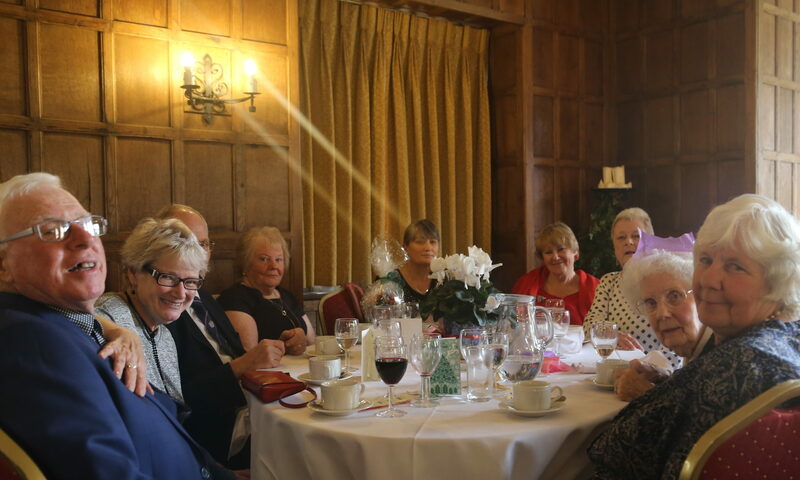 5 members of our WI along with members from South Hythe and Smeeth attended this group meeting, where they were entertained by speaker Michael Herd with a talk entitled “Can-Can, High Kicks and Frilly Knickers”. Our kind hosts provided many delicious cakes. 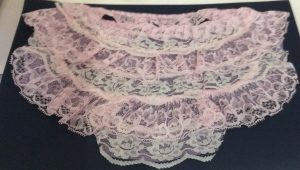 The competition was for a pair of frilly knickers in any medium. And finally Castle Green’s entry.. a rather large pair of Victoria frilly knickers – that won first prize! The 97th ACM was held at The Leas Cliff Hall, Folkestone from 10.30 am – 3.30 pm with an hour’s lunch break from 12.30 – 1.30 pm. The proceedings opened with a rousing rendition of Jerusalem accompanied on the piano by Castle Green member Margaret Ritchie. The meeting was chaired by acting chairman Gill Crone assisted by some of the trustees including – Dorothy Douse – Federation Treasurer and June Kirk – Federation Secretary. Mayor Roger West welcomed members to a very rainy Folkestone. The business part of the meeting included the financial statement for the year ended 30th September 2017 and a short talk from the Financial Adviser engaged to invest the funds from the sale of Beer Cart Lane. It was announced that the next ACM will be held on 25th March 2019 at the Leas Cliff Hall and as it will be EKF’s centenary year Lynne Stubbings the NFWI Chair will be attending. The first speaker Sherrie Hewson was unable to attend on the day and was very ably replaced by Jennie Bond. Jennie gave a highly entertaining talk on her days as a reporter and newsreader with the BBC. She told us many amusing anecdotes mainly focused on her time as a royal correspondent from 1989 – 2003. She had reported on many dramatic and notable Royal events, including the divorce of the Prince and Princess of Wales. Jennie told a very amusing story about a visit Prince Charles had made to the Falklands and Argentina. On the last day he visited an island inhabited by elephant seals that had an excessive wind problem – from both ends! Apparently the Prince had difficulty in keeping a straight face when he mentioned the seals’ flatulence problem to the journalists on the plane back to the UK. Jennie ended by telling us about her time on ‘I’m A Celebrity Get Me Out of Here’ saying how much she enjoyed the experience and that she had raised over £200,000 for the Devon air ambulance by appearing on the programme. 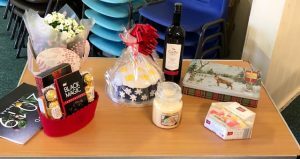 At lunch time there was an opportunity to check out the sales tables with various items on offer including jewellery, scarves, handbags etc. 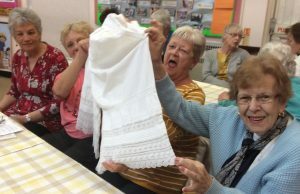 Members were also able to purchase one of the baskets the various WI’s had made up. All had a theme of some kind, eg. gardening, food, sweets, make-up etc. They were all very well done and looked tempting. 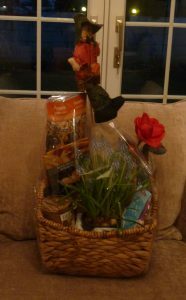 This is Castle Green’s basket of garden goodies, that was snapped up by a very happy customer. After the presentations came the second speaker Chan Jeer, a Consultant Orthopaedic Surgeon who specialised in knee replacement surgery. He gave a very interesting and informative talk with amusing cartoons and anecdotes on the pros and cons of knee surgery. I’m sure many of us who are a certain age have or will have to cope with this operation sooner or later. His lively talk gave us an insight into what to expect, what to look out for and how to prepare by getting fit for knee surgery. This took us to the Denman Draw, 200 Club Draw and the famous Raffle. The meeting was formally closed and then the the new Board of Trustees and Officers were announced with Gill Crone being the permanent Chair for the next two years. All in all, a very enjoyable day! 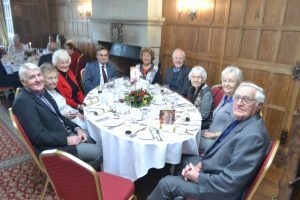 Forty- seven members and guests gathered in the Lads’ Club on January 26th to enjoy another of our Winter warmer lunches. 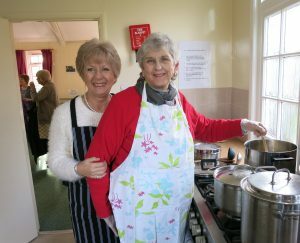 The soup made by WI ladies was warmed through in the kitchen to be ready for serving. When everyone was settled the soup was served which this year was potato and leek accompanied by as usual bread and an innovation, cheese, and chutney. The soup recipe is our next recipe of the month . Click here for the details. A contented hum settled across the room as we tucked in and chatted with friends old and new. When everyone had had their fill tea and coffee was served. Brian Doorne gave a vote of thanks to all those who had organised the lunch and helped in anyway. Weather report for Monday December 11th, 2017. 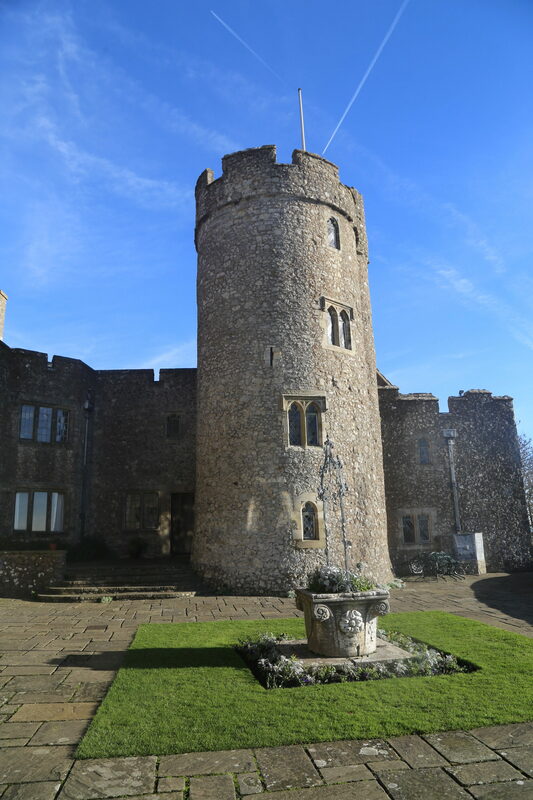 It was very cold, very windy and snowing but undeterred, 49 members and guests made their way to Lympne Castle. Divesting ourselves of many layers of coats, hats, gloves, and scarves we made our way to the dining room where a roaring log fire and mulled wine greeted us. 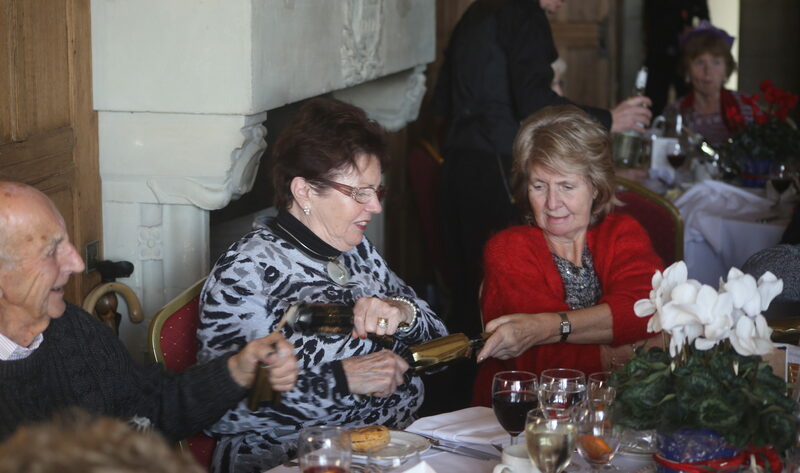 The tables were adorned with beautiful Christmas arrangements which Mary Wheatley had made. 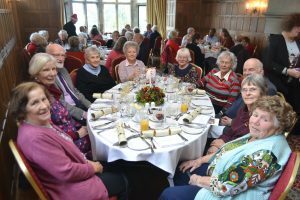 There was a buzz of chatter as we pulled Christmas crackers and groaned at the jokes, which died down slightly when our starters arrived, rose again and the died away when the next course arrived. 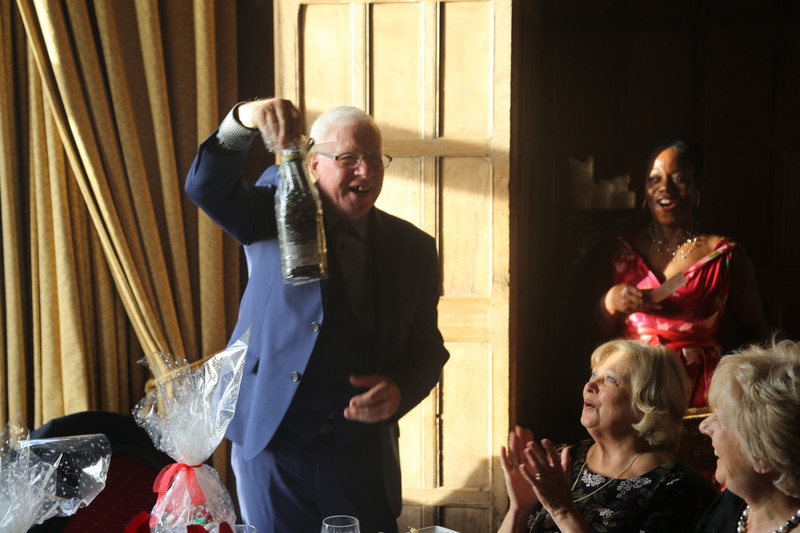 No WI event is complete without a raffle and the lucky winners were able to choose one of the table decorations or a bottle of sparkling wine. 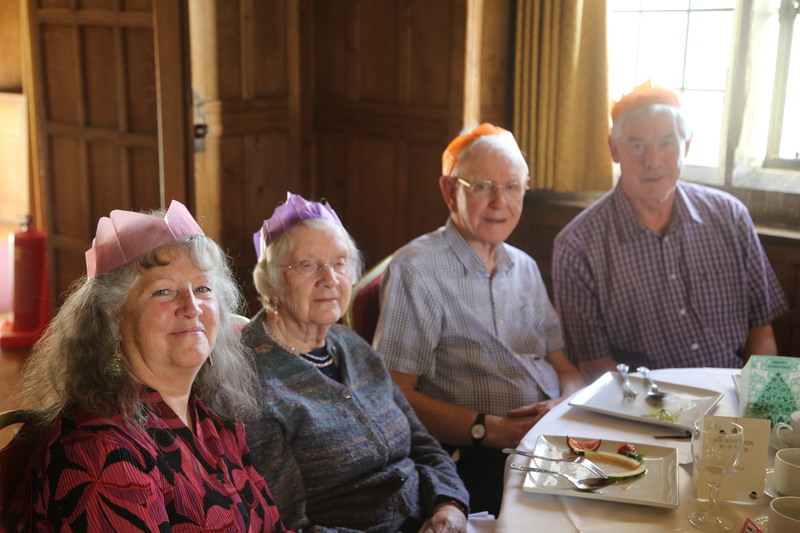 The meal concluded with coffee and mince pies. 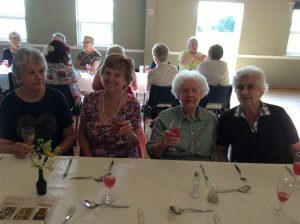 Sheila Daisey thanked Patricia Robinson on behalf of us all for arranging the lunch. So, we bundled ourselves up and braved the elements once more although by this time the snow had stopped and it was just a miserable a cold drizzle. 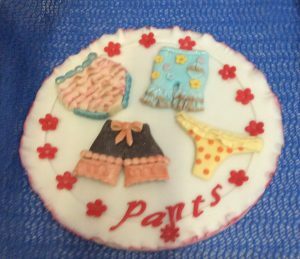 Early on Wednesday 8th November four Castle Green WI ladies set off to Chartham Village Hall to attend the crafts work shop. 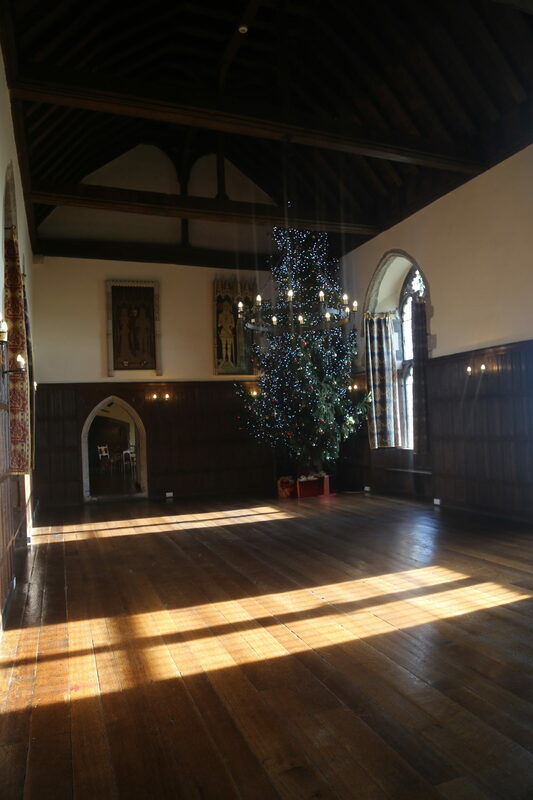 Other Castle Green members had made their own way to the hall. It started at 10.00 am and went on until 3 pm. We were surprised to see a very full car par, but found the last space. The day cost £ 10 and was fully booked. We were registered and sent off to our various craft tables. Dee was assigned to the Christmas decoration group, Kay to the Christmas wreaths made with unusual materials ( jig saw pieces) and Patricia and I to the fabric book table. 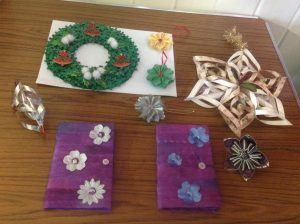 Other crafts on offer were Chocolate Christmas decorations, spinning, making an Elf on a Shelf and other decorations and working with gold thread. Patricia and I had an excellent tutor who instructed us on our craft. We were given a pack with silk strips, sheets of paper, thread and decorations. (This cost an additional £5). We had to iron the strips of silk on to card which was covered with adhesive. Then the hard work started: all the strips needed to be embroidered on to the card with a cross stitch. This took all morning! Then we were given double sided sticky tape which was to be stuck on the the reverse side of our silk work to hold on the first page. This was extremely frustrating and it was nearly impossible to peel off the plastic. Patricia nearly threw her work across the room!! After some help with the task we had to sew in the pages and decorate the front cover with floral decorations. A button and a ribbon were then sewn on to be able to close the book. We completed our books just in time at 3pm. 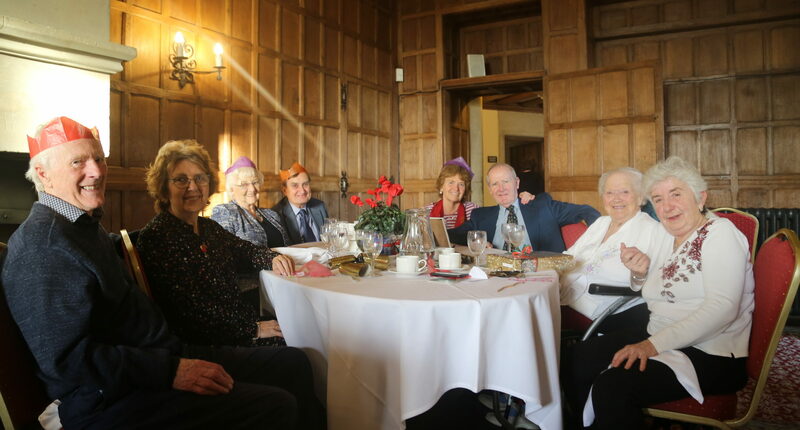 It was a very enjoyable and social day and I will certainly attend again next year. 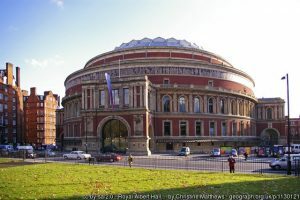 On 28th September Castle Green WI went on a visit to the Royal Albert Hall. On arrival at 11am the group was welcomed and split into 2 groups, each with a guide, for easier access to the various areas explored. Areas not usually accessible to the general public were visited and it was fascinating to see and hear about the organisation behind the scenes. There is a maze of corridors, dressing rooms and store rooms under the Hall, which would be very easy to get lost in. The auditorium in red and gold looked so beautiful as seen from a box not far from the Royal Box. The stage was not permitted and a security man was there to ensure the safety of instruments arranged there for the evening concert of Diana Krall. After a good lunch in the Italian restaurant in the Royal Albert Hall, the tour was continued in the upper part of the building, where anecdotes of ghostly sightings of Victorian ladies were recounted, but none appeared that day ! 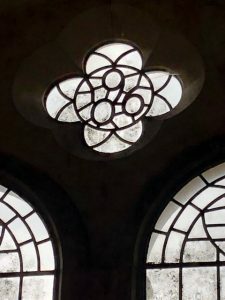 The guides were very good and really knew the building and its history as well as the day to day organisation of the beautiful building that was the brain child of Prince Albert, who sadly died before its completion. This most enjoyable visit ended at 3.30pm and everyone agreed what an excellent trip it had been. On Friday 28th July between 11.30am and 11.45am a steady stream of ladies (and some gentlemen) carrying large bags and assorted containers were to be seen making their way up Rectory Lane to the Lads’ Club. Some passers by may have wondered why, others may have thought, “Ah yes, Castle Green’s annual Pot Luck Lunch and they would have been correct! 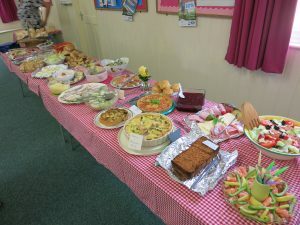 On arriving at the Lads’ Club, the bags and containers were unloaded to reveal a mouth-watering array of salads, quiches, cold meats, and sea food which were put out onto the tables while the desserts were tucked away in the kitchen. 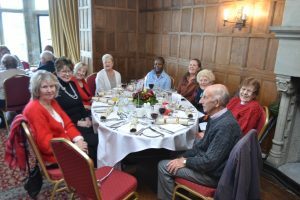 Forty-nine members, husbands and friends sat down and waited for our President Gill Roffey to welcome us and then in a very orderly fashion lunch commenced. The noise level dropped a little whilst we all tucked in and then as it rose again the tables were cleared and the delicious desserts were put out. What a choice! Meringues, fruit salad, gateau, tarts and of course, cream. Brian Doorne on behalf of the guests thanked the committee for their hard work and the members for the lovely food and this was heartily endorsed by everyone. And so, the bags and containers were repacked (much lighter) and we made our way back down Rectory Lane having had an excellent lunch with our friends, a fine example of one of the main ideals of the WI, friendship. Two members of Castle Green WI attended the Birthday meeting of Stanford with Postling on 17th July. 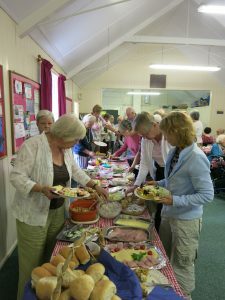 It took place in the marvellous setting of rural Postling Village Hall on a perfect Summer’s evening. 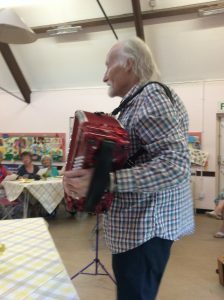 Everyone was entertained by Les and Jane singing folk songs on various accordions. Audience participation was the main focus of the evening followed by scones and cakes. 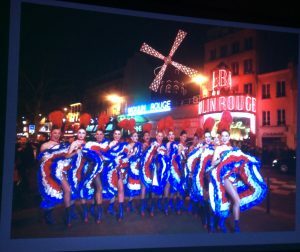 The evening was a step back in time when the pace of modern life was completely forgotten. Five members of Castle Green WI attended Mersham’s birthday meeting on Monday 10th July. We anticipated a fantastic supper and were not disappointed! 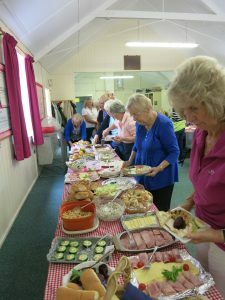 We have to congratulate Mersham WI on producing a wonderful array of savouries, salads and sweets. The meeting concluded with George Taylor and Peter bringing back memories of songs and facts about the 1950’s. Nobody present could resist singing “How much is that doggie in the window” and “I’m pink toothbrush, you’re a blue toothbrush”! In June Kay Hygate had been our delegate at the WI AGM in Liverpool and gave us a very “enlightening” report. During the coach journey to Liverpool Kay had made friends with 2 other delegates and on arrival they decided to explore the city. They ended up dancing the night away at the Cavern Club! On returning to their hotel they somehow managed to get lost and ended up in the kitchens where they were offered a job. The next morning along with approximately 6000 delegates and friends they made their way to the Echo Arena and the meeting started with the singing of Jerusalem. They were then welcomed by the Mayor of Liverpool and the National Chairman Janice Langley. Membership of the WI stands at approximately 225,000 in 6,300 Institutes (so don’t mess with us!). The first resolution to be debated upon was about alleviating loneliness. Some speakers were concerned that wording of the resolution was ambiguous but it was passed with a 69% majority. The first speaker of the day was Jo Fairley co-founder of Green and Black’s chocolate but alas, there were no free samples. The next resolution dealt with Plastic Soup in the oceans. There was much informed discussion on the subject and the resolution was passed with a 98.9% majority. The afternoon speaker was Susie Dent from Countdown and what better way to end a meeting held in Liverpool than to be entertained by a Gerry and the Pacemakers tribute band. Kay thought they were surprised when the audience were singing along and dancing in the aisles. Probably not what they expected from the WI! Kay had arrived home at midnight and written her report on the coach home. Many thanks, Kay. Next AGM 6th June 2018. This time it was Castle Greens turn to host the Group meeting, which was held on the 25th April 2017 at 2.30pm in the Lads’ Club in Saltwood. Guests from Lympne, Mersham, Smeeth, Stanford with Postling and South Hythe WIs along with members from our own Castle Green attended. 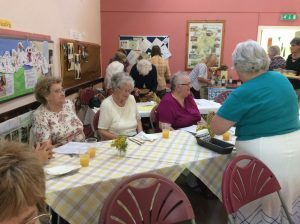 During the business part of the meeting we all heard what our sister WI groups had been up to over the past few months, which seemed quite often to involve the enjoyable activity of sharing food together. An interesting talk with slides was given by Nicholas Reed – entitled the ‘Murder at the Priory’. Nicholas has spent many years trying to unravel the mystery of the murder of the successful Victorian barrister Charles Bravo. Despite investigations and an enquiry at the time of the murder no one was convicted. Since that time there has been much research and speculation with several books published putting forward various theories. We will all have to wait until the end of this year to read his new book to see who Nicholas has concluded was the murderer at the priory. Once again we all enjoyed sharing tea and the delicious cakes generously provided by our members and served by committee members. 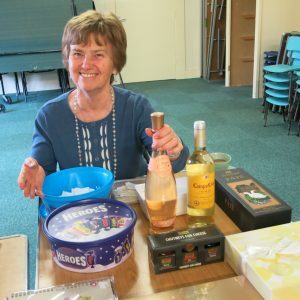 Many thanks must also go to our very able refreshment officer for all her hard work and efficient organisation during the afternoon.